Helen Gould of Old Hall Veterinary Centre, Appleby is a Veterinary Acupuncturist with over 23 years experience. After qualifying from the Royal Veterinary College she travelled to China where she studied veterinary acupuncture. She has been using it in practice in the UK ever since and is a member of the Association of British Veterinary Acupuncturists. Acupuncture is a Traditional Chinese Medical technique based on the flow of Qi (vital energy). Qi flows around the body through meridians (energy channels). When this flow is disrupted in any way (through internal or external influences) then disease results. Acupuncture seeks to restore the normal balance of Qi. Acupuncture is gaining increasing acceptance in the West in both medical and veterinary fields. Over the last few years strides have been made in trying to understand how acupuncture works from a more western point of view. Certain points have been found to influence nerve pathways reducing pain responses and also causing the release of endorphins. There has also been some evidence of effects in the pain centre of the brain. However, a full understanding still alludes us.What remains clear is that acupuncture works and, the fact that animals respond so well must prove it is more than a ‘faith’ medicine.What can be treated with Acupuncture? Because Acupuncture works on totally different principles to western medicine and involves a different diagnostic approach it is usually necessary to examine the animal from a ‘Chinese’ point of view to ascertain whether acupuncture will be helpful or not. 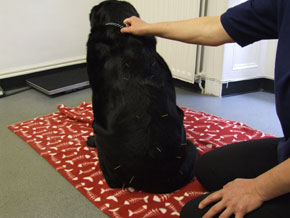 As acupuncture is not a ‘drug’ treatment, it is very useful for animals which cannot take other medication due to an intolerance or coexisting medical condition. At a first treatment, Helen will spend 15 – 30 minutes getting to know your pet and assessing him/her from a Traditional Chinese viewpoint. This is usually done on the floor where your pet will feel more comfortable. You will be present with your pet the whole time as it is important that Helen gets a full picture of your dog’s history. If this initial assessment indicates that acupuncture will be useful she will then insert several needles into various points. This is not an unpleasant experience and most pets actually enjoy the process. Many become quite sleepy and relaxed. The acupuncture generally produces feeling of warmth and relaxation. This is sometimes accompanied by a tingling which can be strange at first. The needles will usually remain in place for between 10 and 30 minutes. Treatments are generally repeated at weekly intervals for the first 3-4 weeks and you would expect to see an improvement within that time. It is rare to see any improvement after just one treatment. If no improvement is seen during this initial phase then it is possible that acupuncture is not the treatment for your pet. This is rare. After this initial phase, treatments would be spaced out to once every 3 -12 weeks depending on the condition treated and the animal’s response. In some cases, the initial course is all that is required! Firstly, telephone Helen to discuss whether she thinks acupuncture is the best course of action. Following that, Helen will need to speak to your own vet to get treatment details and ask for the referral. This is never a problem but it is a courtesy to ask. After that we will book the first three treatments for your dog, then all you need do is turn up!